Foothill Farms® created an infographic titled A Foodservice Guide to Gluten Free. The infographic informs restaurant owners about the importance of offering gluten-free menu items. It contains relevant data from leaders in the foodservice and research industries illustrating trends in dining behavior, popular gluten free menu items, and tips to ensuring a gluten free dining experience. The gluten-free eating trend is on the rise and restaurant owners and chefs are taking note. More and more people are eliminating gluten because of dietary restrictions or lifestyle choices. 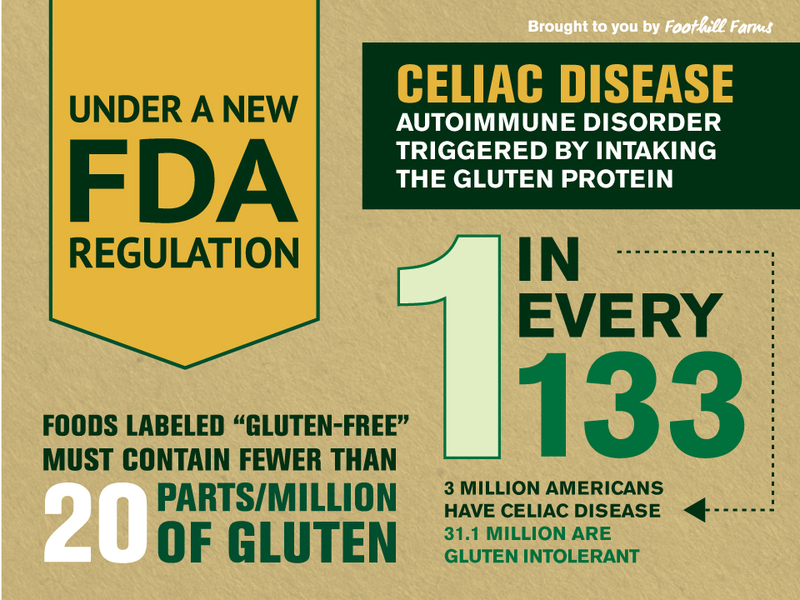 One in every 133 Americans has Celiac Disease, an autoimmune disorder triggered by consuming gluten protein. 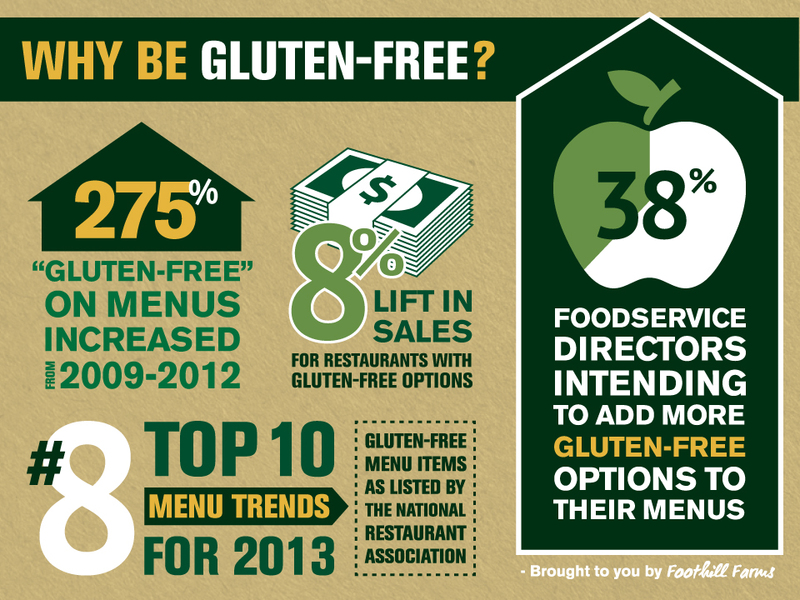 Because of this statistic, we created an infographic titled “A Foodservice Guide to Gluten-Free“. The infographic informs restaurant owners about the importance of offering gluten-free menu items. It contains relevant data from leaders in the foodservice and research industries illustrating trends in dining behavior, popular gluten-free menu items, and tips to ensuring a gluten-free dining experience. The infographic also details a new FDA regulation that determines how much gluten can be in a product before it can legally be labeled gluten-free as well as details on cross-contamination in kitchens. Gluten is a protein found in wheat, barley and rye. If a person with Celiac or gluten-sensitivity chooses a dish at a restaurant that is labeled gluten-free, they do so for health reasons. If they get sick with symptoms similar to a gluten reaction, they will likely not return for a second dining experience. Secondly, if a family member is gluten-sensitive or has Celiac Disease they are likely to influence dining decisions. We offer 67 gluten-free products, including mixes for dressings, gravies, sauces, soup bases, cheese sauces, seasoning and desserts. Recently, our marketing staff created an easy reference sell sheet for operators wanting to offer gluten-free menu items which is located under the resources/marketing materials tab on our home page. For K-12 customers, our gluten-free sell sheet has been expanded and targets a wider scope of dietary restrictions. The “Kids’ Allergens, Intolerances and Special Diets” sell sheet features Flavorwise™ products in an easy chart that showcases gluten-free products as well as products free from nuts, crustaceans, lactose, HFC, no added MSG and vegetarian products. It is also housed under the resources/marketing materials tab on our website. We hope that our infographic is helpful to you! That’s why we created it!